USING AN AUTO-DISCOVERED Boingo hotspot while we took a coffee break in Starbucks, I fired off a Qik news report with just a few items from New York papers, including Obama's live internet video chat , the slowdown in production of green tech by Chinese manufacturers , Google's Connect Ads , and Sony's touchscreen e-book reader . The Obama online meeting resulted in a commitment from the President that he would not legalise and then tax marijuana. I wonder if he'll grow the tax base through some other kind of innovative measure. These four short items are a simple test of Boingo's pricing structure as well as a test of the Nokia E90 working under low light conditions. We should have used a brighter table for our Qik video momemt. 1. 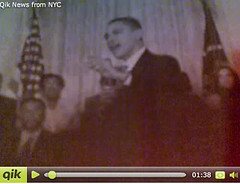 Sheryl Gay Stolberg -- "Obama makes history in Live Internet Video Chat" in the National section of the New York Times, 27 Mar 09. 2. Page One Story -- "Slowdown in China's Factories Stymies Entrepreneurs", Wall Street Journal, 27 Mar 09. 3. Jessica Vascellaro -- "Google Aims to Connect Ads for TV, YouTube" in the Technology section of the Wall Street Journal, 27 March 2009. 4. Sony's e-book readers now connect with 500,000 free titles from Google's trawl of the public domain.